After out actor Anthony Rapp publicly accused Kevin Spacey of sexual assault, it was only the start of Spacey’s fall from grace. Rapp told Buzzfeed that Spacey assaulted him over 30 years ago when he was 14. Spacey’s non-apology coupled with coming out as gay, upset just about everyone (especially Zachary Quinto). Most people saw his move to expose his “open secret” as nothing more than a cynical ploy to deflect attention from Rapp’s allegation. 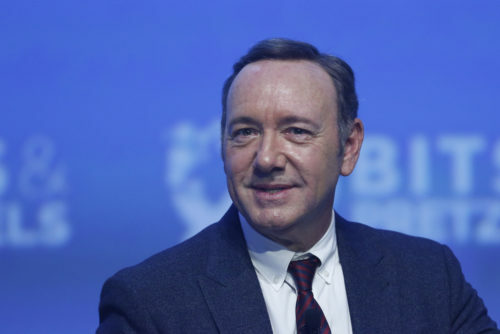 Now other people are stepping forward with their own stories of Spacey’s bad behavior – including former news anchor Heather Unruh who tweeted two weeks ago that Spacey had assaulted her friend. “If a woman who saw what happened didn’t tell [the alleged victim] to run while Spacey got up to go to the bathroom, I don’t even want to think about what would’ve happened,” Unruh told the Globe. Another woman is also stepping forward to say that Spacey “groped” her friend while working at London’s Old Vic theater. “Was apparently always known as one to avoid. Sadly unsurprised,” she wrote on Twitter. The account has now been made private. While no further victims (as versus friends of alleged victims) have come forward, most LGBTQ journalists are assuming it is only a matter of time. Spacey’s lecherous exploits and temper tantrums have become legendary. The International Academy of Television Arts and Sciences added to Spacey’s bad week this morning by announcing they are rescinding an award he was to receive in November. “In light of recent events, it will not honor Kevin Spacey with the 2017 International Emmy Founders Award,” the group said in a statement. Netflix also quickly announced that it would end its hit show “House of Cards” that stars Spacey as calculating politician Frank Underwood. While the network had indicated that they would end the show after the current season, the timing of the announcement spoke volumes.